Christmas is rolling up and it's time to start thinking about how to delight your friends and family! Personally, I love planning gifts and ways to delight people so Christmas time is a dream time for me (the only limit being money). 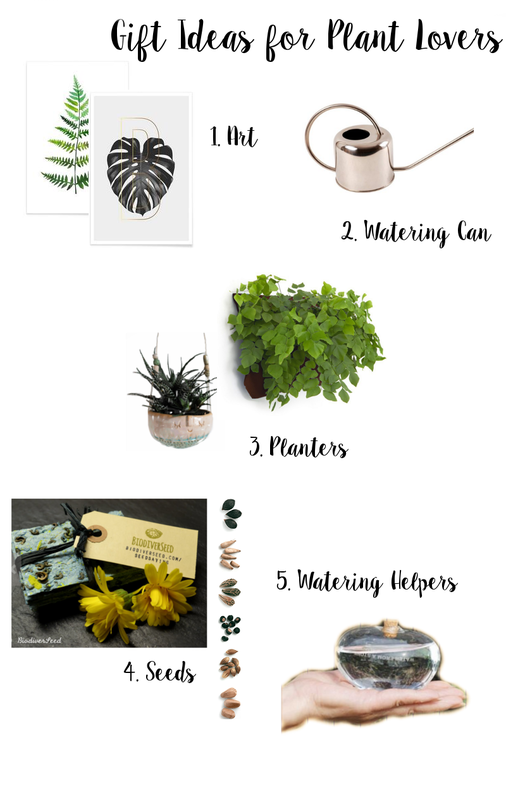 As a plant lover myself, here are some tips! These posters from JUNIQE are absolutely stunning and made by some small business artists. Who wouldn't want some more greenery up to their walls too? Just like there's never too many plants, there's never too many planters. From basic terracotta pots to these creative beauties, a plant lover will surely be blooming with joy! I have a secret to confess: my "watering can" is an old plastic bottle cut almost in half... There are some gorgeous watering cans on the market today, so you can't really go wrong with this one! 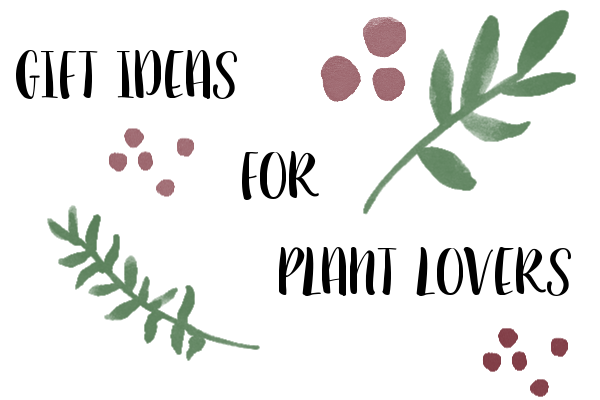 If you have your own seeds or you buy some from a store, a plant enthusiast will be swooning over this quite unique and personal gift. There's something all gardeners fear when going on a vacation: who's going to water your plants? These watering helpers erase that kind of problem! Last weekend even Southern Finland got it's first taste of snow! People were setting up Christmas lights and the general atmosphere of the whole country was quite peaceful (might be because quite many people had a power outage). Here are some of my favorite shots from last week. As you can sense from these pictures, the mood color of the weekend was grey. I love this kind of serenity in the middle of a very hectic period of my year. How was your weekend? Have you got snow already? I was photographing around this island town on a gloomy September day. Here's some of the best shots! I haven't been really active lately due to a massive amount of school work but I'll try to post a few photos and stories now and then! I'll post an update about my plants next week. I've had an aquarium for about five years now. I got really into fishkeeping then and got a 112L (~40 gallon) tank back then. There's been times when I've not been so interested in it, but I've always kept up with the maintenance and made sure my fish were healthy. Here's some pictures of my tank. Current inhabitants are 4 albino corydoras, 3 peppered corydoras, 5 cardinal tetras and 8 flame tetras. Below is an older picture, after it I've lost 2 cardinals to a mystery disease. And here are the newest addition, my beloved flame tetras. They are super greedy and mean and I am head over heels in love with them! Do you guys have aquaria or have you planned on getting one? I want to hear! There has been a huge lack of updates on this post - blame the Finnish summer for starting! I'm mostly on holiday (still a few exams left), and even though the weather has not been blessing us yet, to me summer has already started. The reason for that is that I've already accomplished something that is almost vital for every Finn in the summer: getaway at the cottage! My hubby's grandparents had rented a nice cabin for some relatives since it was the granny's 70th birthday and so we headed to Eastern Finland for four days. The weather was brilliantly sunny, but unfortunately horribly windy at the same time. We didn't let that bother us, especially because the wind kept most of the mosquitoes away! The cottage had a regular sauna inside, but also a smoke sauna near it. There is something magical about the atmosphere in a smoke sauna: the walls are blacked with the smoke from centuries past, the "löyly" (the heat wave you get when you throw water on the stove) so soft and mellow and not too aggresive smoke-scent lingering in the air. The effort to get this is rather big: you have to start warming the sauna at least 6 hours before it's ready. You block the vents so the smoke from the burning woods gets trapped inside and roasts the place. Then you open the vents so all the smoke gets out and burn more wood to get to the desired temperature. But the long effort results in long-lasting heat: the sauna was warm even on the next day! Above are some buckets outside the sauna and below is another example of staying warm: a glass of quality cognac. Finnish summer experience would be nothing without these two ingredients below: grilled sausage and beer. Finns eat humongous amounts of grilled sausages every summer, even to the level where they're jokingly called summer vegetables here. I'm not a fan of Finnish beer, since it's very watery, but this Czech beer is one of my favorites. There was no boring moments on that weekend: somebody was always ready to play football, throw some darts or whip up a round of poker. We even invented our own games, with the bets of running around the cottage, drinking, or having to go swimming after sauna. The birthday girl and her son cooked us amazing meals and my hubby heated the regular sauna every night to the perfect temperature. But the most magical moment for me was when me and my hubby both couldn't get sleep so we stayed up till 5AM and talked about our past, future and dreams, watched the sun rise at 2AM and finally fell asleep on eachothers arms. That's some Finnish summer magic! I'm wishing a splendid summer to all my readers! In the end of April I visited Frankfurt for a weekend trip with my family. My cousin is working there now so she promised to be our guide! I love Germany and since I was 2 years old, we have visited the country at least once a year with my family. Here are some pictures from our recent trip. In May Day (1.5.) it's traditional in some parts of Germany to do a Maiwanderung, meaning a May hike. I don't know the origin of the event, but in the present it mostly mean getting a bunch of drink with you and walking around the nature or city with your friends, drinking at the same time. In the Rhein-wineregion there's also a Weinwanderung held, in which local wineries offer taste offerings for the thousands of hikers. It was a rainy day and bit of a drive to the start point of the official Weinwanderung, so we did our own by walking a hiking route in a forest and some vineyards. There was so many of these snail on the trail and it turned out we should've probably killed them instead of marveling them since they were Spanish slugs and eat pretty much everything in sight. We we really hungry after the hike (which had ended in us practically rolling down a vineyard hill because the path we walked suddenly ended), so we visited a restaurant buried deep inside the forest and vineyards. It was next to a parking lot where a lot of hikers, including us, had left their cars, so the place was quite crowded. Despite that, the service was good and the beer even better! The star of the meal, although, was this salad I got. It was simply stated as a mixed salad with turkey strips on the menu but WOW, was it good! I'm not lying when I say it was the best salad I have ever eaten. The view from my cousin's balcony was a beautiful city view with some lovely, still light-green trees mixed with clean cars. This trip really charged my batteries and I can't wait to visit again soon! After looking at that picture of the salad again, I'm really craving one now. Where have you had your best salad? Comment below! The plant exactly is peperomia deppeana. I already mentioned wanting it in the Houseplant-plans -post so I could plant it in the orchid terrarium, since it also requires airy soil and humidity like phalaenopsis does. 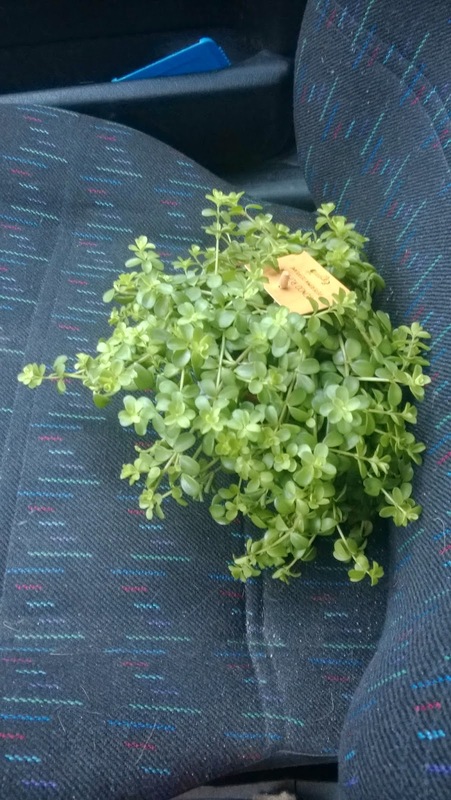 So after getting peperomia home, I started to scape the terrarium! I had a bit of orchid potting mix I got from my mom and it was basically mulch, leca and a bit of soil. I wanted some height differences to make it more interesting, so I dumped an empty egg carton there, next to the bowl full of water (to provide humidity). Then I covered the bottom in the potting mix. I also repotted the peperomia in a mix of regular potting soil and orchid potting mix. Hopefully it'll be airy enough! I left the plant in the plastic pot from and put it in the corner next to the egg carton. Then begun the hardest part: mounting my miniature phalaenopsis. I got these pieces of bark from a forest near my parent's house, along with some moss. I removed the phal from the pot and cut some of the dried up roots. It had clearly been in the pot for quite long, since most of the roots were curled up in the bottom! Well, what else can you except from an IKEA plant... I was so scared of damaging the good roots that m hands shook the whole time. But I put some moss on the curve of the bark and then just adjusted the phal on top of it so that about half of it roots go to the other side and half to the other. Then I tied some yarn around it so it won't fall down when I lift it to the tank. All well so far! I had some pieces of bark and moss left so I arranged them to the tank in a way that actually pleases me quite much! I still have to get a cover glass to trap the humidity more, but so far so good! What do you guys think? Have you made any kind of terrarium (succulent, cacti, orchid) lately? I'm a dreamy health sciences student from central Finland. Blogging about life; my home, my plants and my travels .